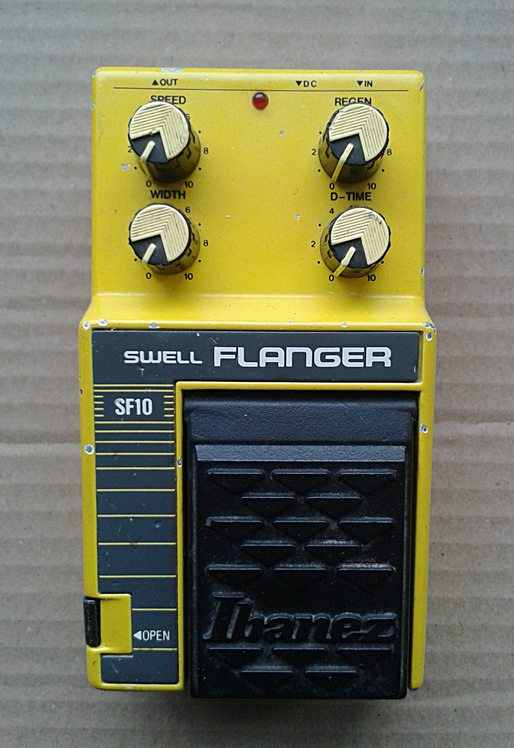 Ibanez SF10 Swell Flanger from Ibanez 10-, or Power series. Made in Japan, 1987. Swell. I have no idea where the name comes from. But does it matter? Probably not. 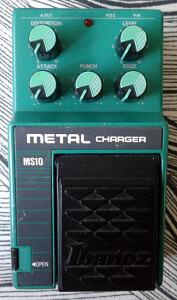 Solid 10-series pedal with nothing off from the rest of the bunch. The series is rather large with “only” 36 titles in it. And when we take in to account that this series wasn’t manufactured for too long (from around ’86 to ’89 – less than four years), there are bound to be some recycling on the designs from earlier series. The number of different units and the vast number units being traded at auction sites makes me think that the Maxon factory had to be running on full between 1986 and 1989. Board and build quality is on par with the others in the series and also on par with the L/Master series. After all, both series were made in japan. Actually, the difference between the series are minor. The rubber mat on top of the stomp lid vs. the hard plastic lid and the slightly cheaper pots. Of course the naming of the units and slight visual differences too. But for the main boards, these two series are a very close to each other. Now that i remember, i’ve actually seen more Master series units with broken pots than Power series units with the same fault. Funny. Most folks will simply repeat the mantra found on numerous forums – “the power series pots are worse than the good pots on master series”. Due to my limited empirical experience, no. That is not correct. Sure the Master series pots feel sturdier. But right now, i’m not that convinced about them being simply “better”. It sounds exactly like FL9 and FLL. Deep, powerful flanger with great set of controls. This unit goes from that glassy, brittle, static and thin tone all the way to the airplane territory. In addition to those two ends, there is everything in the middle. A chorusey flange, a vibrato-like wobble and so on. Exactly like a great flanger unit should. What more can i say? Versatile flanger that will suit most situations where flanger is needed. A classic. And a standard in great flanger units. If you are in denial about greatness and proper use of flangers, this (or any of its sister models) is the unit to try out. 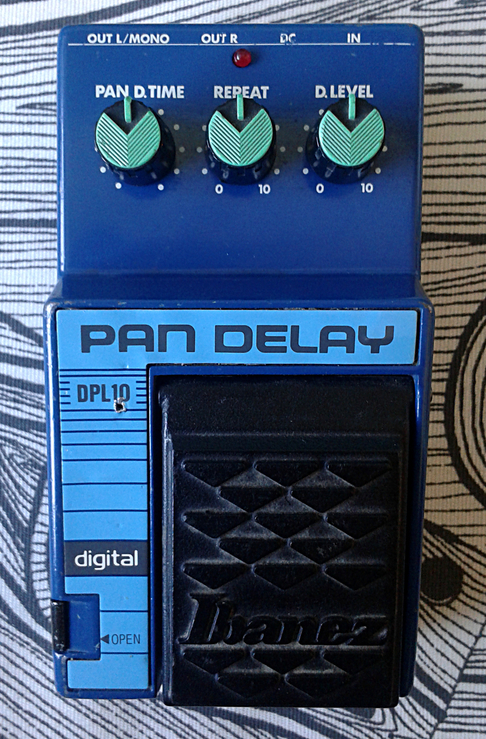 Ibanez PDL10 Digital Pan Delay from 10/Power series. Made in japan in late 80’s. Got this as a defunct unit from one finnish guy i did some deals and trades with. As it was not passing signal, the previous owner had borrowed the stomp lid to another pedal. 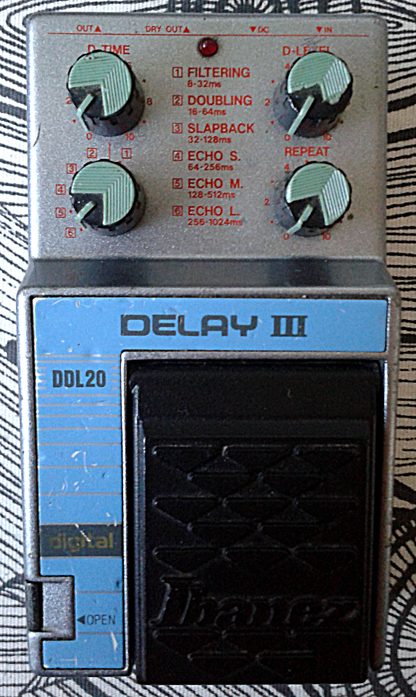 Gladly, i happened to have one to spare from a defunct (completely dead) DL10 i sourced long ago in a deal of a few pedals that were not in working order. So. To the debugging. 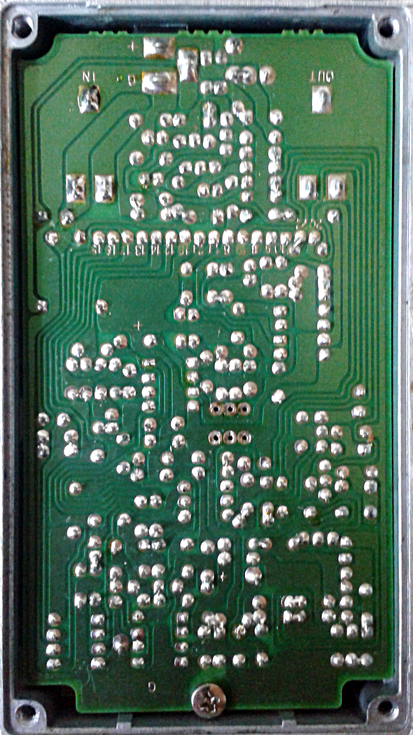 The signal died at the input buffer that was a half of 4558 SIP chip. I initially assumed that the chip was dead and it took a while to me to order a few of those in. As those, obviously, are not that common parts to be had lying around (now i do have a few if i ever need them again). 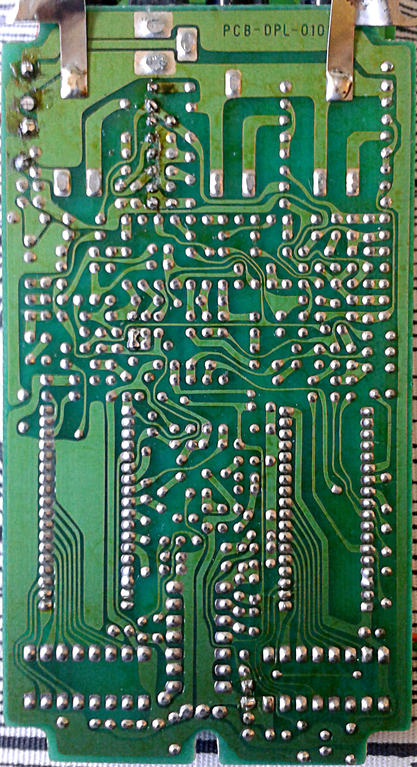 As the voltages on that chip pins didn’t look healthy, my assumption was the chip being dead. 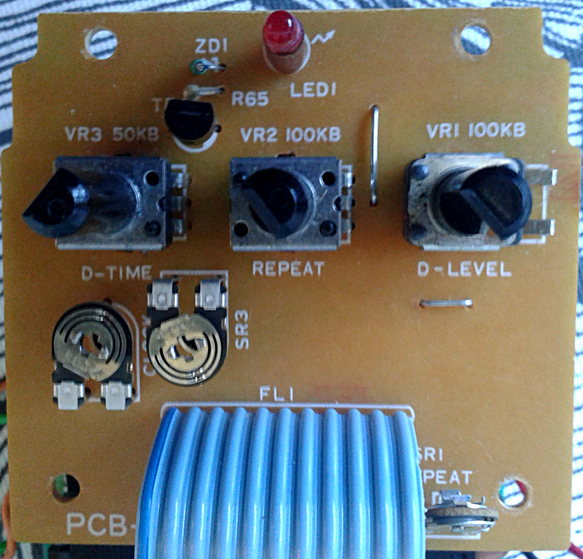 The rest of the circuit seemed to be in working order, as when i injected the guitar signal to either one of the M50195P digital delay chips, the output was correct. Swapped the 4558 for a new one and nothing. Still the voltages were off by any standards. And of course there’s no factory schematic around for this unit. So i had to do some detective work to find out what was wrong. I noticed there was a separate reference voltage network for the input buffer and the measured voltages on that network were off too. In other words, the reference voltage wans’t there. 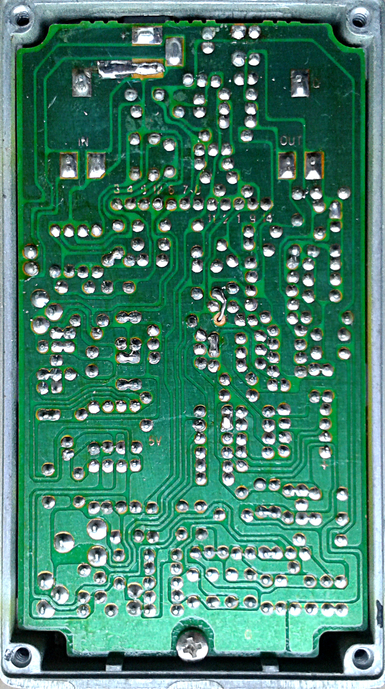 The chip was getting the supply voltage, but the reference. I widened my search for the cause and everything seemed to be in order. 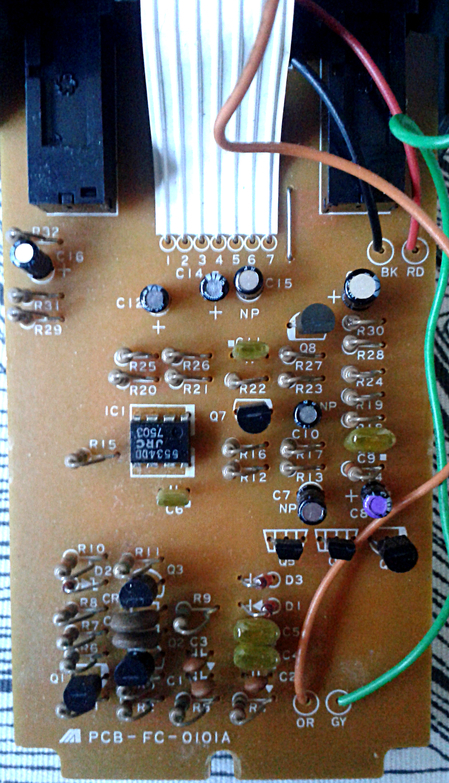 But the input buffer still didn’t get its reference voltage. Went on to check more and more and tested the continuity of a few key spots for this netork. Finally i found it. 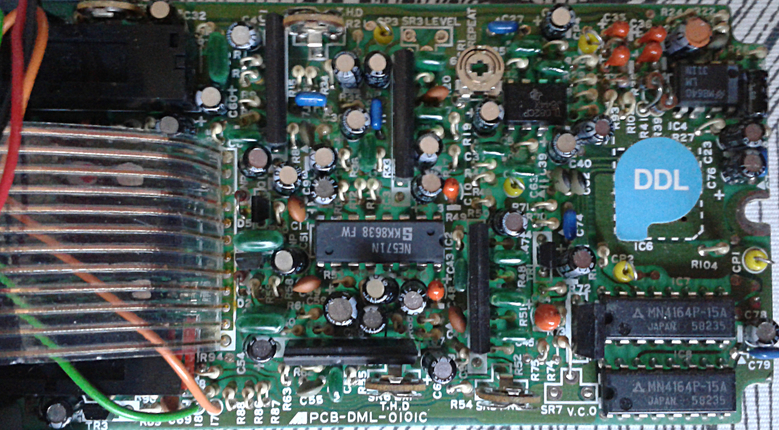 It’s not that common for the 10-series to have two sided circuit boards. 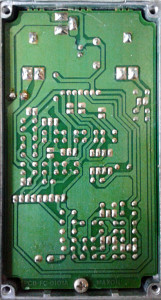 Most of the designs are utilizing a single sided board with other side for solder and other for components. This is not the case with PDL10. 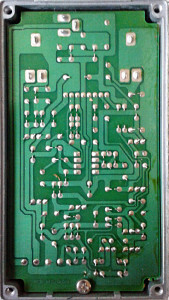 And when i think it more, this is not the case for any of the more complex boards, mainly delays, in this series. So i finally found the reason for the defect and what was causing it. 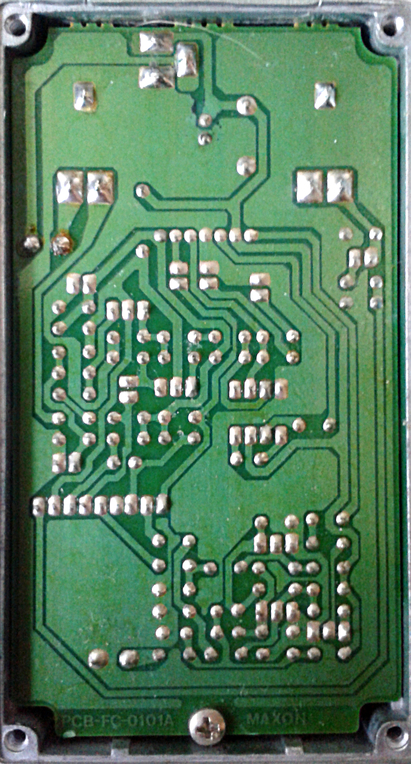 At one point, this unit has gotten a jolt from reverse polarity power supply. 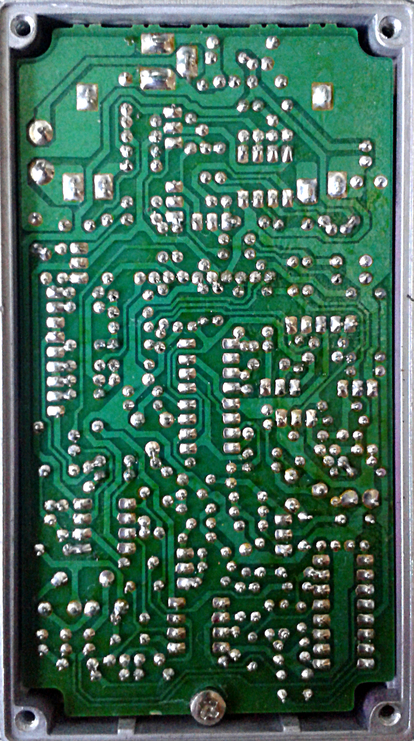 Due to burnt out parallel polarity protection, the diode has been replaced after the incident. 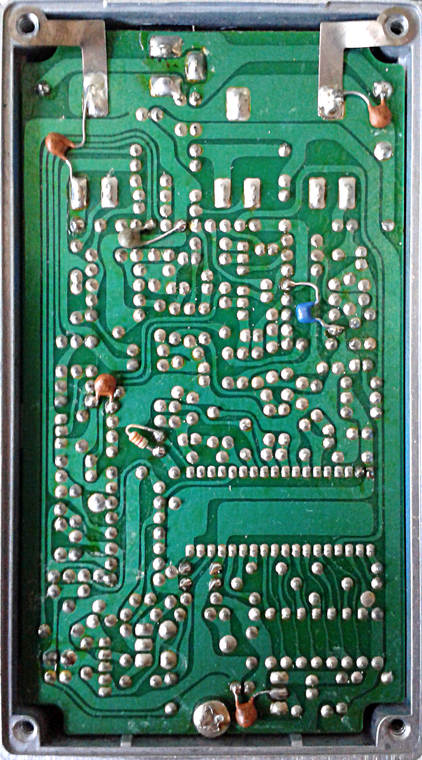 The person who serviced the pedal soldered a new 1N4007 diode in place and since that didn’t fix the pedal, he must have deemed it totally broken. But no, it wans’t totally broken. 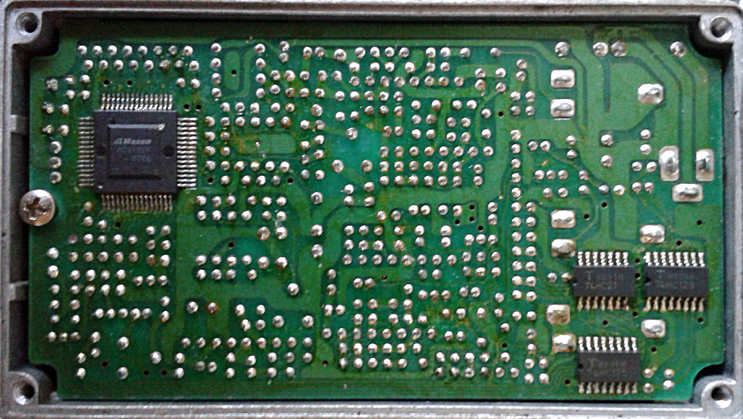 The issue was that the cathode side of this polarity protection diode acts also as an via, which connects the supply voltage to the other side of the board too. And this via is the spot that takes the supply voltage for the voltage divider of the input buffer’s reference voltage network. 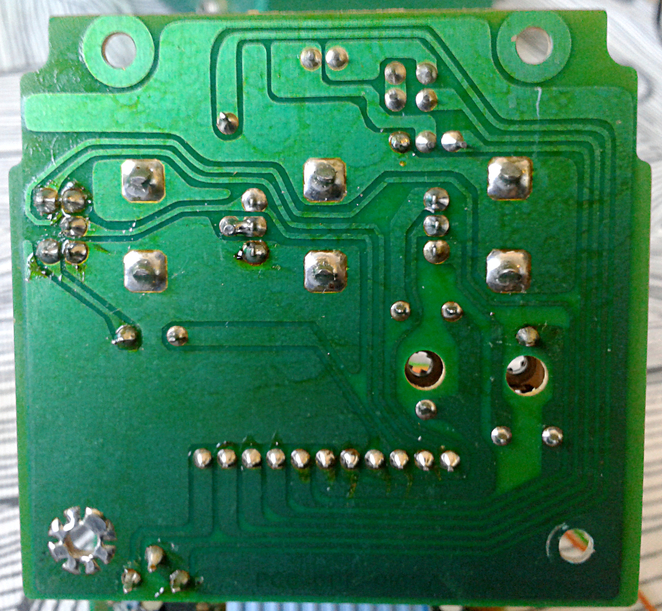 And since the diode wasn’t soldered properly on the component side, but only on the solder side, the network wasn’t getting its supply voltage. 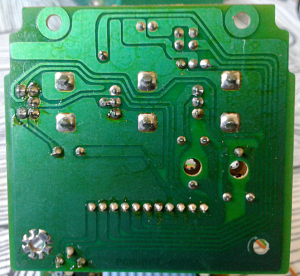 I then reflowed the solder around the diode and boom. Working PDL10. Repairing this unit was a great challenge and i’m more than happy that i could do it. 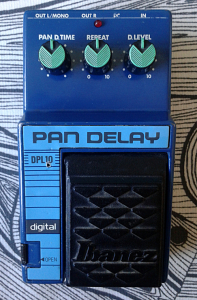 This Pan Delay is already enjoying a “rare” status and the prices are what you would expect from a rare mid-80’s Ibanez pedal. The design is pretty cool, but since it is what it is, a hit it was not. Sure. 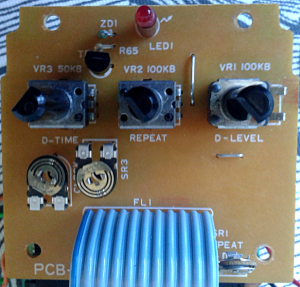 One can use this in a similar manner than the DL10, which has the same digital delay line inside, but in that case, 50% of the effect is unused. 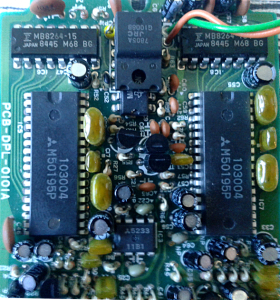 Pan delay in this case means that there are two delay lines constantly out of sync with each other. The input signal is splitted to both lines’ input and the outputs are separate. Meaning that the outputs are meant to be used for stereo. This way the other delay line pumps its repeats in one phase to to the left output and the other pumps its repeats, out of sync, to the right output. And this creates our ping-pong style panning delay. Not that many panning, or ping-pong delays out there. And at least to me, the reason is pretty simple. Most of us use out pedals with guitars. Guitars tend to have one output and amps tend to have one input. So the stereo use is best to leave with studio experiments. Either way. It is a beautiful unit with crowded board and neat board design. Definitely a one trick pony, but a rare specimen of this particular trick. Amazing unit to have. Good. 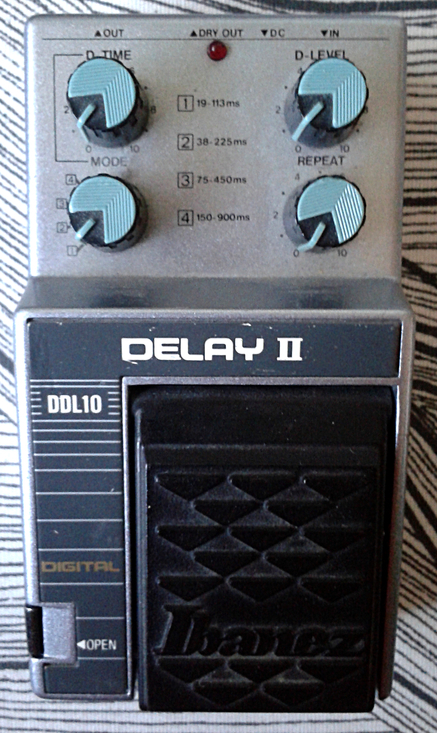 It can be used as a single delay line, and in that scenario it doesn’t differ much from the sleek and smooth hi-fi digital delay tones of the DL10. Actually is sounds exactly the same. I think one could achieve the same sounding effect by splitting a signal for two DL10s and somehow creating a separate sync for those. It is clean and nice sounding delay with nothing too special in its tone. The ping-pong output is the speciality on this one. Great unit for studio work. 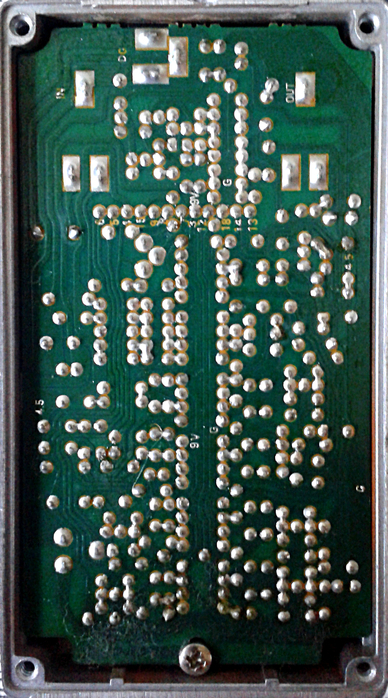 Ibanez DDL20 Delay III from Power series. Made in japan around mid 80’s. I should count the Ibanez delays. Yup. At least 18 different delay units are listed at the Effectsdatabase. Sure, this includes all the units from different series since 70’s, but that’s still a lot of delays. The features on this particular one are great. From slight 8ms tracking effects, all the way to 1024 milliseconds of delay. And every possible delay time in between. The six time ranges are selected on a switch, otherwise the controls are your standard Mix = Delay Level, Time = Delay Time and Feedback = Repeat. 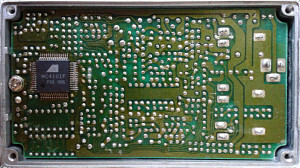 Once the bottom plate is removed, there are a ton of neat little solder joints for through hole components and a Maxon branded digital chip. 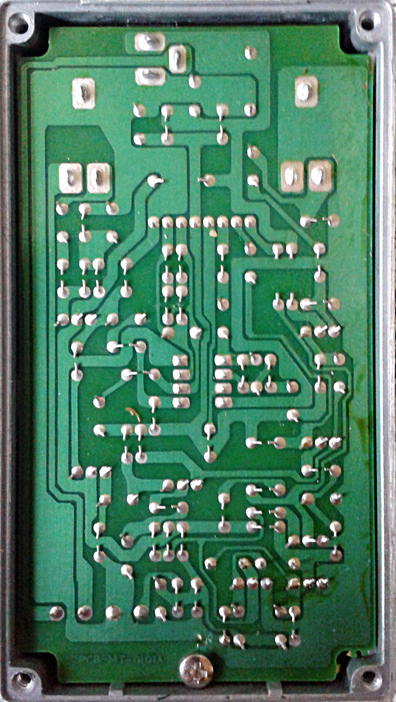 Bottom of the board looks like green leather jacket on a punk. May the joints represent studs. And once we flip the board around, there are 6 SIP opamps, three more Mitsubishi bipolar dual opamps in DIP packages and a regulator. That’s a lot of stuff squeezed into such a little board. 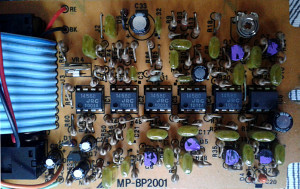 Stamp on the board shows that this unit shares the board with DML Digital Modulation Delay. As you can see from the first shot taken from the bottom, there are a few empty pads. The board design pleases the eye. But i do apologize for not going deeper in to the design itself. Reason being that i don’t understand it well enough myself to say anything insightful about it. Well built and designed. These unit will endure use. Not special, but very, very good. Like most Ibanez delay units, this one offers solid sounds. Which is also a weakness for a few Ibanez delays. Where almost every single Ibanez unit has its own character and a face, so to speak, the delays from Power and Master series are sort of Ibanez’ line on Bosses. There’s nothing wrong with them, but some of them do tend to sound rather generic. This is one of those. Makes me wonder why did Ibanez release three different, un-modulated digital delays for Power series? I have no idea. The feature differences are slight and the overall sounds from all three are close to each other. All of them are action packed and sound good. With similar setting on each, i doubt many would survive a “Pepsi Challenge” if i played with all three to you with your eyes blindfolded. None of that makes this a bad sounding unit. If you see one for cheap, grab it. These do not move around too much these days. 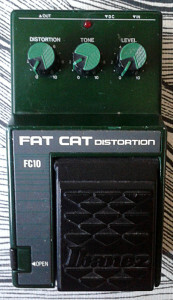 Ibanez FC10 Fat Cat Distortion from Power series. Made in japan between 86-89. The first Ibanez take to replicate the ProCo Rat was a success of its own. 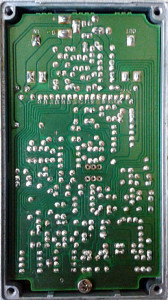 A buffered Rat with standard Ibanez electronic JFET switching. Sure there are numerous other Ibanez takes on the Rat later on, most with more drastic changes on the designs, but this one – It’s pretty much one to one with the original Filter control reversed to act as a more commonly used tone configuration. 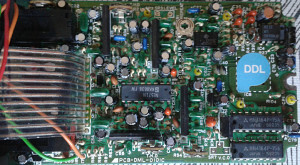 Solid dull traces and everything is as everything is with most of the Power series boxes. There are various schematics available, but from the experience, the one at Dirk’s page is the correct one. The board has a lot of room on it. 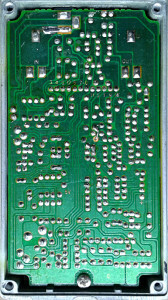 The switching section is located at the lower left corner, so the size of the effect itself is just small. 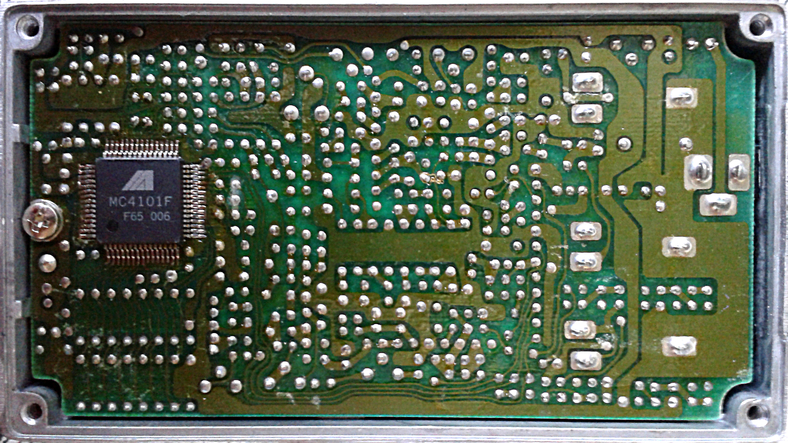 Due to asymmetry of the component layout, this one gets a harsh judgement from me. There’s enough room to paint pictures with the layout, but no. 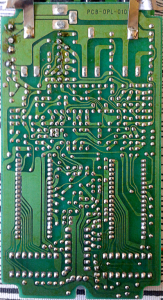 The chip in the Fat Cat is JRC5534 single opamp, which has the needed compensation and balance features. 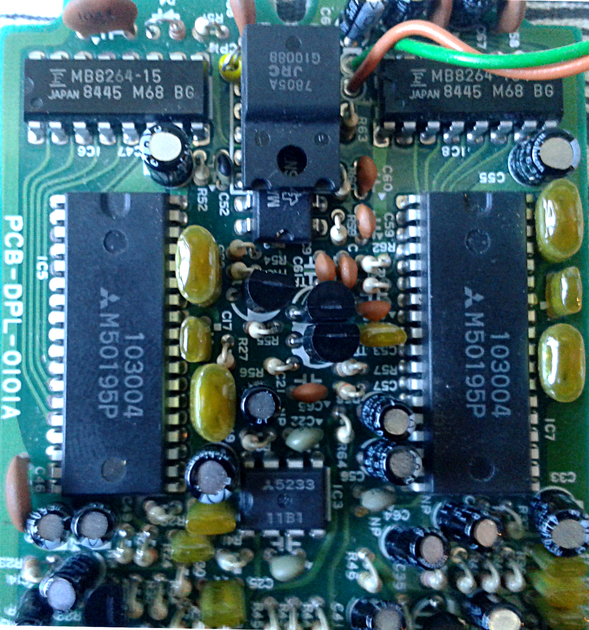 Those are, however, in between other pins than in the original choice in Rats, the LM308. So one can’t turn his/her FC10 into 1:1 Rat by just swapping the opamp to ProCo specs. For the units i’ve seen on sale, they all went immediately. I don’t think the unit is that rare, it just seems like it is very desired distortion. And by considering the sound, i do get it. Like a Rat with a way higher input impedance. Meaning that your pups won’t load as much as they do on the original Rat/Rat2. Aside from Tone control working in more conventional manner, there just isn’t too much of a difference to the sound. The changes are for the better, so this might be a nice option. If you can, get one. For cheaper than a reissue ProCo Rat/Rat2 that is. 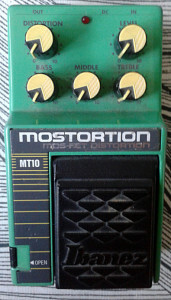 Ibanez MT10 Mostortion MOS-FET Distortion from Power series. Made in Japan, late 80’s. As the Ibanez Power series pedals come, there aren’t that many original designs that have risen into cult status and are priced as such on the used pedal market. The MT10 Mostortion is one of those, filling this void with OT10 Octaver. Both of these are sort of one offs in the Ibanez back catalog. Where the OT10 is the only Octave effect from Ibanez, the MT10 is the only MOSFET (metal oxide semiconductor field effect transistor) based overdrive/distortion and it has three band EQ as well. I try to think of other Ibanez driver pedals with Bass/Mids/Treble controls.. Nothing comes to mind (ok, the Tubeking distortion etc. but let’s just say that three band EQs are not a standard Ibanez way of doing things). Saw this unit for sale with a reasonable price and i just couldn’t let it go. There’s some visual magic going on with the traces. Normally i would dismiss traces like this with a snarky “meh” comment, but not this time. Maybe it’s just how all the components are distributed nice and even all across the board, instead of super-engineering the left upper corner and leave everything else blank. The schematic is up at ToneHome, and it shows how the EQ is made. Pretty cool to see something of a standard three band EQ drawn like that. 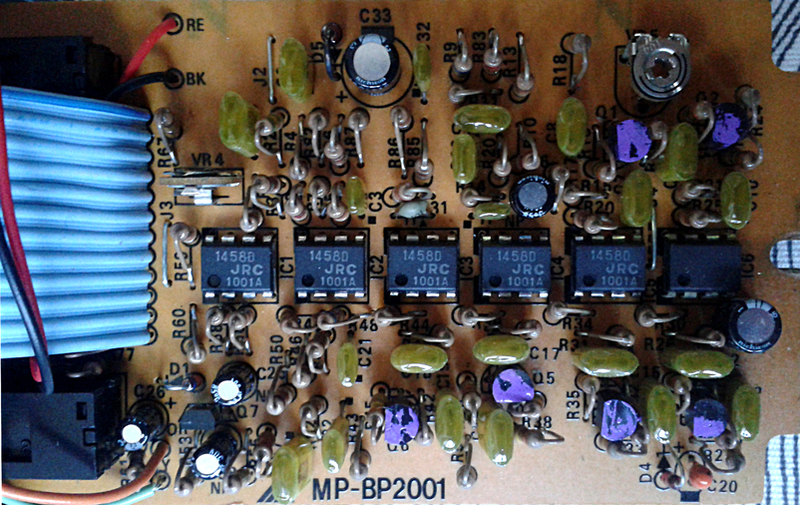 Base topology is a buffer -> clipping amp -> three band EQ -> EQ recovery amp and an output buffer. Quite standard, but still something we won’t run into everyday. 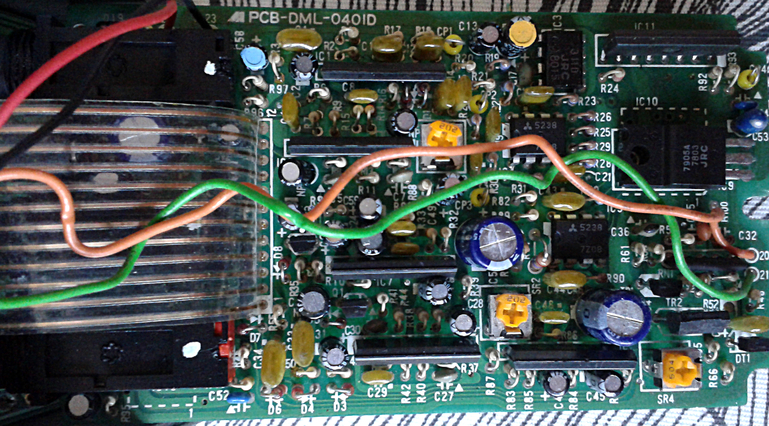 It’s the opamp that makes this a MOSFET desing. Harris CA3260 to be exact. This obsolete amplifier may be the biggest reason why this design doesn’t have reissues and the number of available clones is low too. This, at least in part, would also explain the prices these currently sell for. The sound is definitely one of the factors affecting the prices. From slight, cool boosting overdrive to harsh and cold metallic distortion. 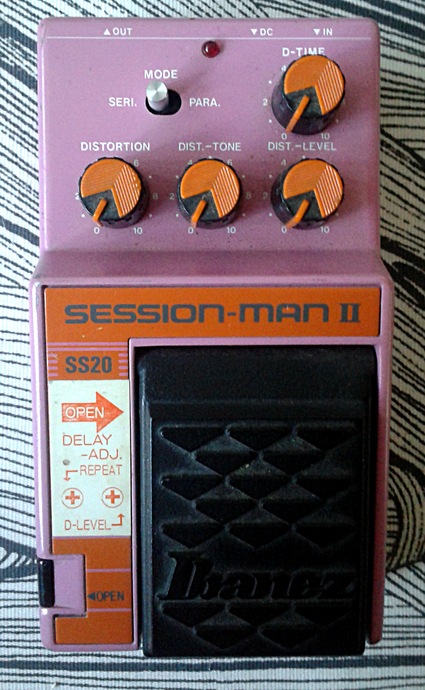 Way more versatile than the first modern box i would compare this to – the ZVex Distortron. 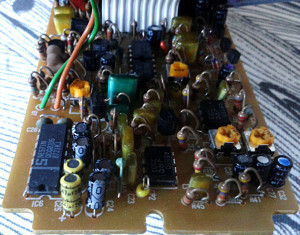 Overall tone also reminds me of a Marshall MOSFET 100 Lead head’s distortion channel. There’s this MOS signature sound going on that some people just love. It does have a face and sound of its own. Which is only a very good thing. I don’t think we really need that many more TS sounding boxes in the world. Besides. This simply rocks. 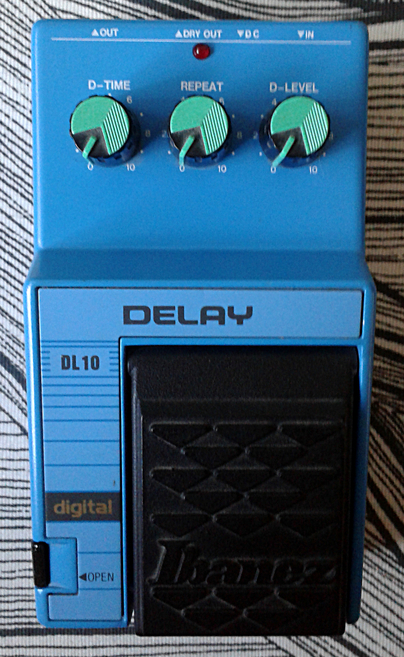 Ibanez DL10 Digital Delay from Power series. Made in japan between 1986-1989. The Ibanez delays are usually highly praised and for a reason. Solid construction and nice design. When i think of it, many other types have design flaws. This of course isn’t limited to just Ibanez. Still. usable delays are more common than, for example, usable distortions. The design here seems to be pretty much the same as found on DL5, or, we could once again argue that DL5 is just a remake of this unit. 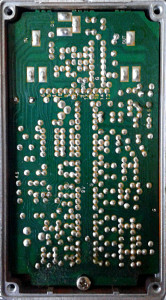 Opening the standard 10-serie box shows a couple of components mounted on the solder side of the board. This always makes me a little suspicious. This time, i think the components are there by the manufacturing process. I reached this conclusion by having obtained a second DL10 in defunct state. Or it would be highly unlikely that two separate units (one bought from canada and the other from a local guitarist) have the exactly same mod performed on them. Hand drawn acid trip traces always make me smile. This time there’s another vow-factor due to crowded digital board and the hand drawn traces. 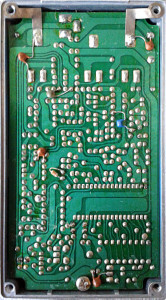 Heart of the delay circuitry is Mitsubishi M50195P, which is one of the standard echo family chips Ibanez has used on most of their delay circuits. Including Master series Flanger and a lot of others. 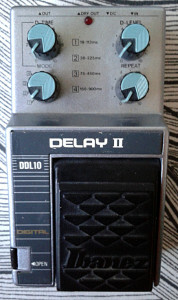 Good delay pedal needs to be simple to use and still offer more controls than just one tone. The Power series delays are all pretty good items. This one is more of a simple standard, while the others offer more and more special features. Let’s face it. Maxon designers have had their spoons flying pretty high in the 80’s. 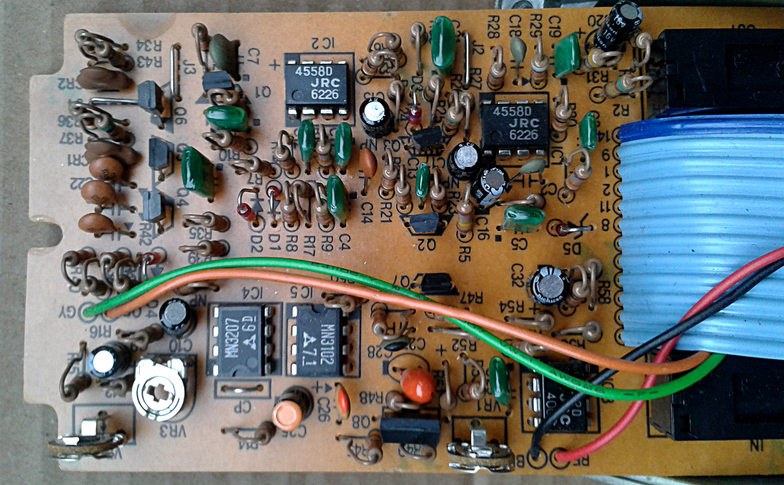 After all, there are seven different delay designs in a series which was manufactured from 1986 to 1989. Like a very nice delay with reasonably good control range. This stretches from tight slap back to neverending feedback with nice long delay time. This unit is common and lots of people are still using it for a good reason. Usable. Not much more to add. 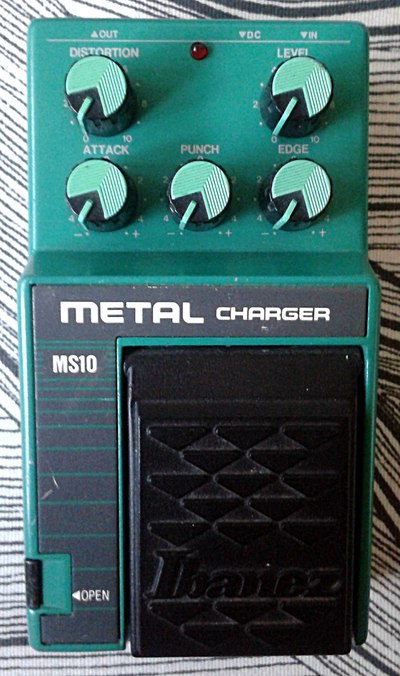 Ibanez MS10 Metal Charger from Power series. Made in japan between 1986-89. Apparently, these units were a big seller. Which is once again something that i find intriguing. How does a very average distortion design with obvious fault in it become a big seller? I really do not know the answer to that question. Do you? The fault i’m talking about is the low output level, which doesn’t rise above unity even with both, Level and Gain controls maxed. Gladly, this fault can be addressed with relative ease, as i’ve done with my unit. I do feel quite sad about that, as most people tend to think this is a collectible unit and so it’s ok to keep asking near astronomical prices for very common Power series box – with a built-in fault. No question about it. If i come across another unit in decent condition, and more importantly, for a reasonable price, i’ll grab it. One of the dullest board designs in the series. 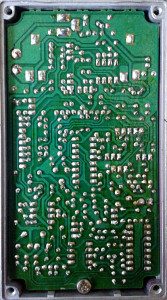 The circuit design is quite complex with couple of separate clipping stages. As you can see from the photo above, i’ve removed one of the hard clipping stages to get the overall level up. Also swapping/upping one of the caps from the tone section is a thing i recommend. That way you can get more bass in addition to standard Ibanez mid-hump. For some reason i’m missing the component side photo of this unit. I wouldn’t be bothered. 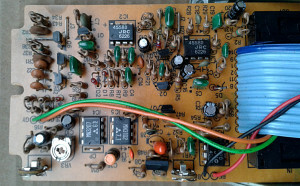 The SML from Master series uses the same board. To me. Not much like anything. The more bass and omitted one clipping section do make it a lot better, but still it is nothing more than mild distortion driver. With the mods the overall tone is a lot more overdrivish than anything that i’d associate with a “metal” distortion. Stock unit works the best with a high gainer tube head – when pushed into the drive channel. Modded one works well as a standalone overdrive too. Not the worst distortion pedal there is, but definitely not among the best either. Despite everything. I’d recommend the mods. 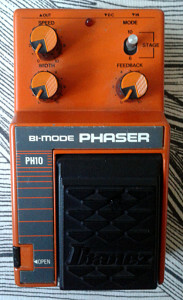 Ibanez PH10 Bi-Mode Phaser from Power series, made in japan between 1986-89. One of the nicest phasers. The Bi-Mode here means that the phasing stages are switchable between six and ten stages. Which is not a bad idea to throw in to a huge bowl of phasers. Got this unit for a reasonable price from J. Linden of Linden guitars. As i tried it out, i felt like the six stage mode was losing the phase from most of the sweep. That could only mean one thing. The unit had went misbiased over time. I’ve seen this happen with new units too, so it’s not that uncommon. 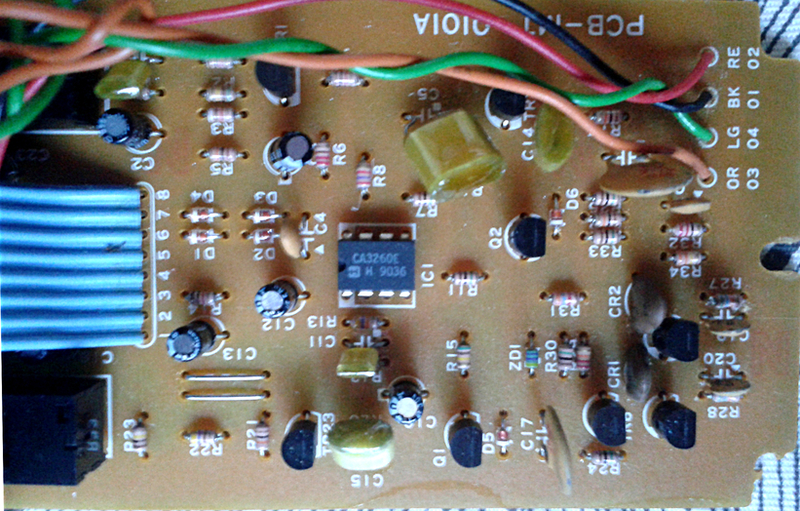 Biasing the JFETs with the trimmer is a bit of pain on this one, but i think i nailed in the first 5 minutes or so. So all i needed to get this unit running properly was a screwdriver and a hint of patience. As most of you may already know, i’m a sucker for symmetry on the board layouts. The idea of placing all six ICs in a single row is a heart warming visual candy. 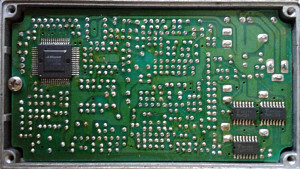 As for the design.. As the photo below shows, there are six JFETs responsible for the phasing. So how does it become 10-stage phaser just by a flick of the switch? The design sort of re-uses the first four stages in the 10-stage mode. Quite an elegant solution. 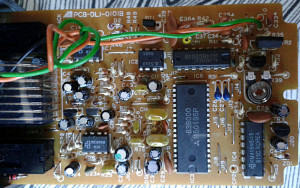 You should be able to find the factory schematic PDF through your favourite search engine. I’m not linking it here.. 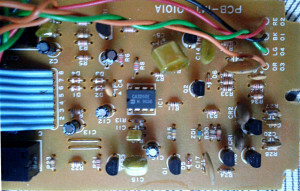 The feedback control takes the signal from output filter and pushes it back to the beginning of the phasing stages through the one half of a dual opamp which is there, just to drive the feedback. This is very nice feature as well. I’ve seen this type of feedback network used a lot on different flanger designs, but not in many phasers. So. 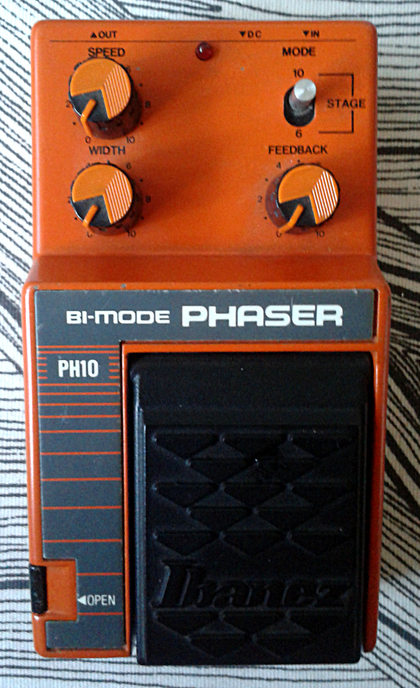 In general this is pretty versatile and neatly designed phaser. Definitely more usable than the standard and overly cloned Phase 45, 90 or 100. Like a good phaser tool with lots of versatility on the controls. On six stage setting it is not that far away from Phase 100, but the feedback control lets you tweak this to a lot thicker and much more psychedelic swirls. Now if we take the ten stage setting, the sweeps and swirls get even more depth and psych on. The slow ambient sweeping on both, 6 and 10 stage settings are really good sounding and usable too. Once again, the feedback control takes the trophy home. Very good phaser. Entries (RSS) and Comments (RSS). 52 queries in 0.201 seconds.